A big bag for all your gaming gear. Asus is adding a rather large backpack to its growing line of bags and carrying cases covering an assortment of electronics. This newest entry is the ROG Ranger, a large backpack that can swallow up to a 17-inch class laptop while still having room for several accessories. The ROG Ranger backpack is made from durable, water-resistant 1260D Gucci polyester with a polyurethane panel on the back to provide protection for your gaming gear. Should you happen to find yourself in stormy weather, there's also built-in rain cover that tucks into the bottom to keep your laptop and assorted peripherals dry. "ROG Ranger has a high-volume design that fits a large amount of gear with smart organizational features, such as a detachable accessories panel and removable side pocket to make contents easy to find. 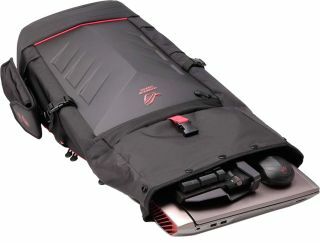 Its unique foldable closure system provides extra capacity when needed and opens wide for effortless loading and unloading," Asus ROG explains. ASUS hasn't updated its website with a product page just yet, but in the absence of listed specifications, there's a video of the ROG Ranger backpack showing just how much it can hold. In the video, you can see it being stuffed with a 17-inch laptop with external power brick, keyboard, mouse, rolled up mousepad, headphones, and a smartphone. There's also an integrated security lock to thwart opportunistic thieves. The ROG Ranger looks like a nice addition, albeit one that's not really built to ride the VR bandwagon. As for when it will be available and for how much, Asus has yet to reveal those details.